Most soil types but best if it's moisture retentive with some dug in compost. Semi-shade, a cool sunny spot or inter-planted between other crops. Beetroot, Dill, Chives, Basil, Carrot, Strawberry, Radish, Spinach, Cabbage, Spring Onion, Onion, Onions and Poached Egg Plant. Early planting can be done under cover in modules or under cloches outside. Continue sowing outside every few weeks for a continous supply. Early sowings are easily attacked by slugs and snails, so may be best in containers. Thin out to give plenty of room for each plant to grow. 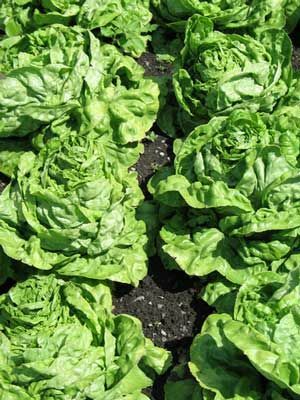 In hot summer conditions lettuce can bolt (produce flower heads) and becomes tough and a little bitter. When the heart of the lettuce feels firm pull the whole plant up and cut off the roots. Harvest in the morning when the leaves are cool and full of moisture.